I am constantly looking for new flavor combinations with vegetables. I keep thinking, I’ve just have to make them more exciting, especially since we are eating less meat, and I know that a lot of my readers are vegetarians. So last night I came up with this one. 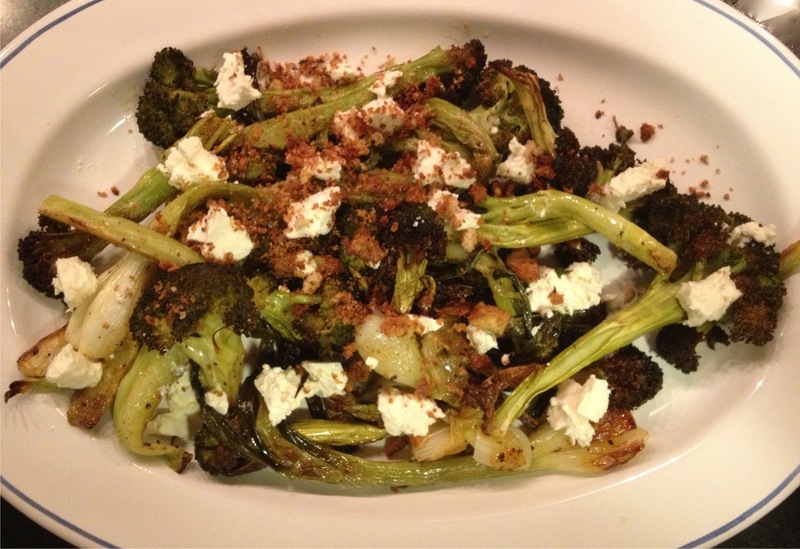 Roasted broccoli and spring onions topped with feta cheese and toasted bread crumbs. The bread crumbs were really leftover croutons that were too few for another Caesar salad, so I crushed them up in my mortar and pestle and threw them on top. Easy, right? This is why you should always make extra croutons! 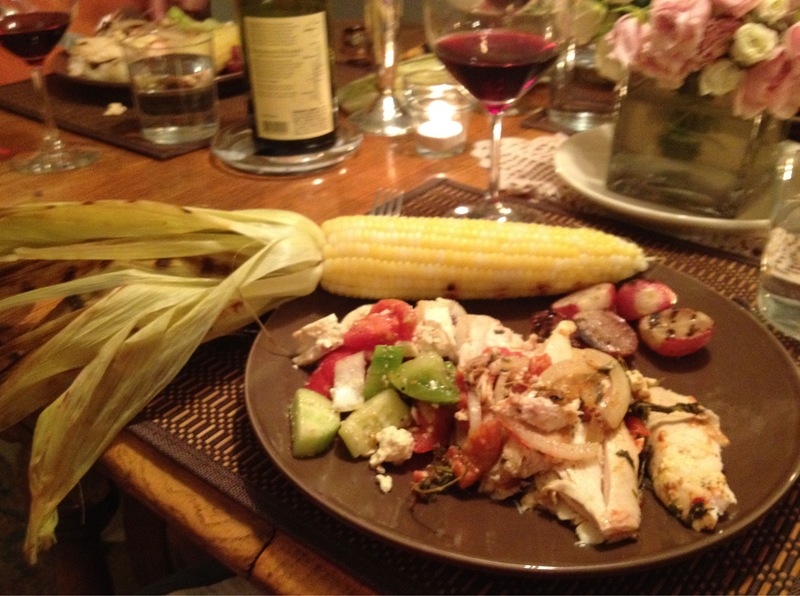 The more you cook, the more you can have various, ready-made ingredients at your disposal. Preheat oven to 400 degrees. Wash, trim and peel stalks of broccoli and cut lengthwise into similar sized pieces. On a baking sheet, combine the broccoli with the spring onions and toss with the olive oil. Season to taste with salt and pepper and place in the oven to roast. Check at 15 minutes and toss. Total time should take about 35 minutes or until the stems are fork tender to your liking. I love it when the broccoli florets get a little charred in places. 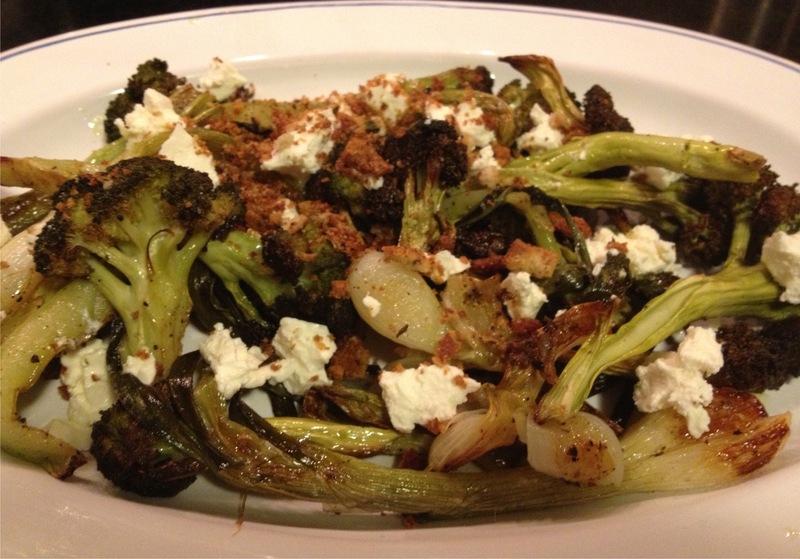 Place the vegetables on a platter and top with crumbled feta pieces and the bread crumbs. Enjoy!! 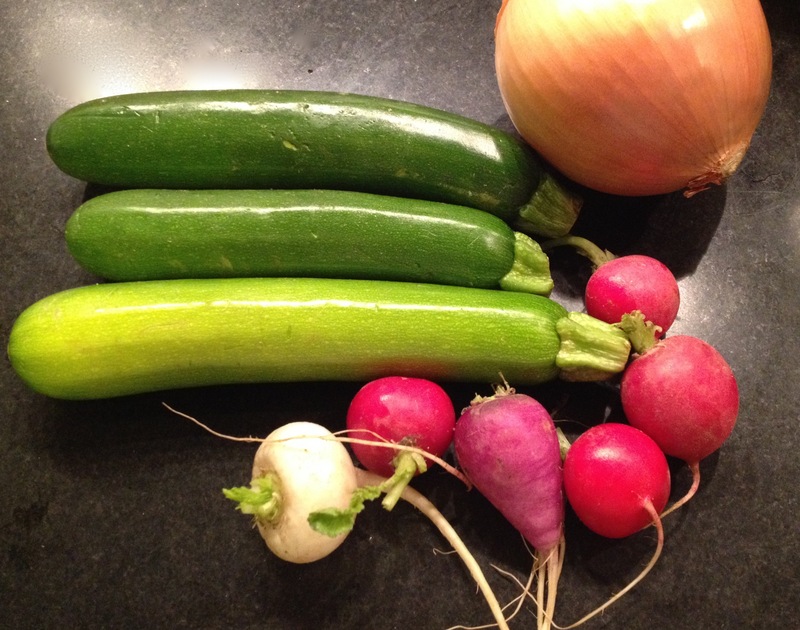 While this heat wave we’ve been having here on the East coast has been trying, to say the least, I love this time of year, with the bounty from the garden, which will be ending soon. (The lettuce is about to bolt and this extreme heat is not helping.) 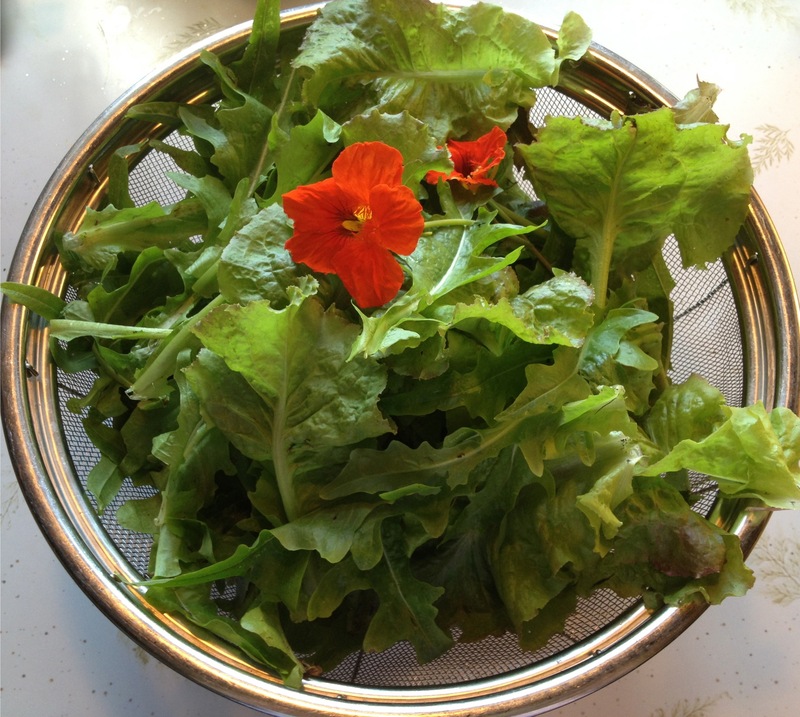 Here’s the lettuce and nasturtiums I cut from my little garden last Sunday. And here is our Tuesday night dinner. This is how you can make a quick, easy and super delicious weeknight dinner. If you think a little bit ahead, it’s a breeze, you won’t heat up your kitchen, and it’s light and healthy. Perfect for this time of year and particularly during this heat wave. 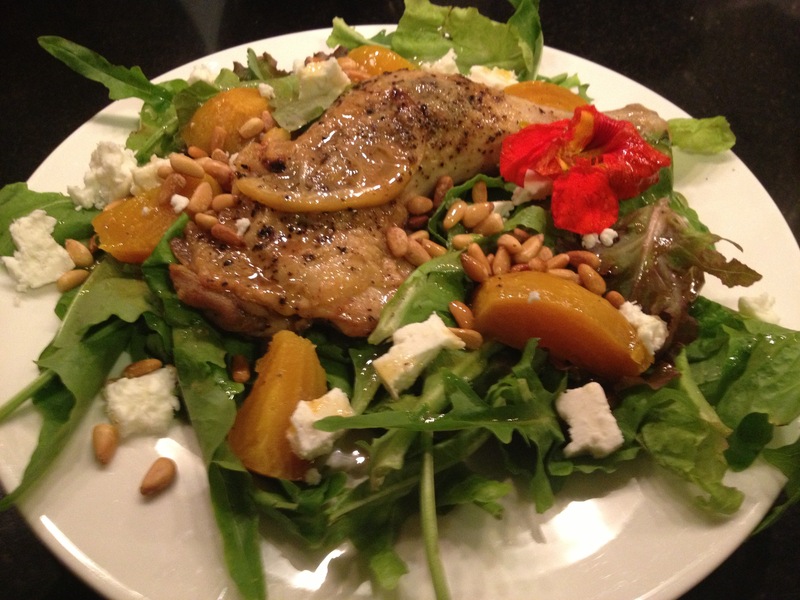 On Sunday, before I went on an hour-long bike ride, I threw a bunch of golden beets in the oven to roast. Those guys cooked and I was out of the hot kitchen! Now you all probably know how to roast beets, but just in case, here a little recipe. Beets are a great vegetable because you get two in one!! You can roast the beets and then sauté the beet stems and greens in olive oil with garlic. I almost like the greens better than the beets, and you don’t have to cook them at the same time. Beets, refrigerated will keep a long time, the greens, not so much, so use those sooner rather than later and come back here soon to see how I used them in another layered vegetable dish that was loaded with fresh flavors. Some grocery stores are now even selling prepackaged beet greens. I prefer to get the real thing, attached to organically grown beets. Who knows what they put in those bags to make them last longer in the grocery stores. Preheat your oven to 375 – 425 degrees. You can roast them anywhere in this range. I like to use 400 degrees. At the lower heat, they will just take longer to become tender. Trim the beets from the greens, scrub with a vegetable brush and dry with a paper towel. Place in the center of a good-sized piece of aluminum foil, drizzle with the olive oil, season with salt and pepper and draw up the foil to seal and make a neat packet. Place the packet in an oven proof dish (because the beets may leak and make a mess in your oven) and roast for one hour. Remove, open packet and test. A skewer should pierce the beet easily and completely. If not, put back in for 10 more minutes or so. Once done and cool enough to handle, peel the beets and use immediately or refrigerate in a covered container and use within four or five days. They rewarm easily in a microwave as well. 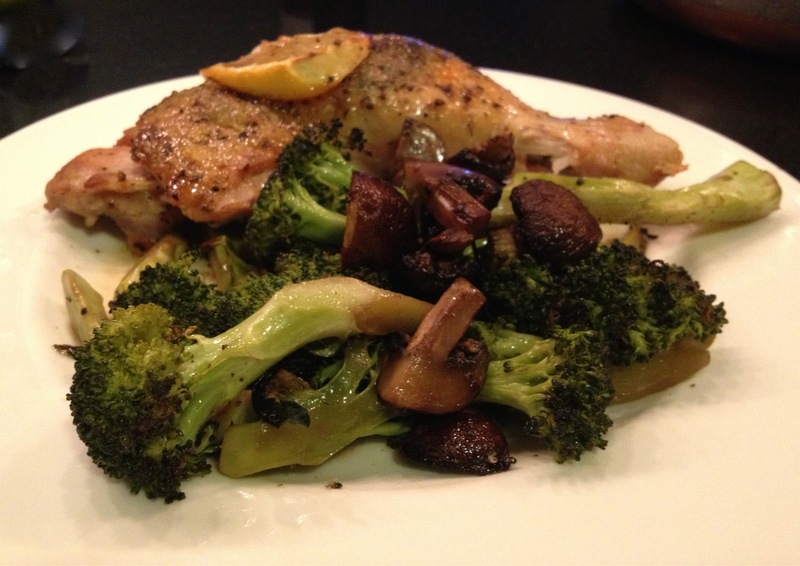 Here was our dinner on Sunday night, when I made Provençal chicken legs with oven roasted broccoli and mushrooms. This is easy too! I made four leg and thigh pieces for the two of us, so we could have the two dinners. For the broccoli and mushrooms, toss those with two tablespoons of olive oil, salt and pepper and roast at 375 degrees for 35 – 40 minutes while you’re roasting the chicken. Wash and dry your chicken legs. Mix together chopped fresh herbs with the lavender, salt and pepper to taste, and mix in 1 – 2 Tbs. of olive oil to moisten and make a paste. Carefully loosen the skin on the chicken on one side and place one bay leaf and one-quarter (about 1 Tbs.) of the herb mixture under the skin and spread around underneath. Make sure the skin is still attached in one or two places. Salt and pepper both sides of the chicken. Heat the remaining tbs. of olive oil in an ovenproof skillet on medium high heat. Place in chicken legs, skin side down, and brown for 5 minutes. When nicely browned, turn legs over and place one lemon slice on each leg. Place the skillet in the oven and roast for 30 – 35 minutes, or until the meat registers 160 degrees with an instant read thermometer. Let rest for 5 – 10 minutes before serving. So we ate 2 of these on Sunday night and saved 2 for the weeknight dinner salad. The bay leaf is not edible so remove while eating. Warm the chicken legs in a microwave for 1 -2 minutes, depending on how powerful your microwave is. Warm beets in the microwave for 1 minute. Cut each beet into 4 or 6 wedges, depending on the size of the beets. Place lettuce on a dinner plate. Place the chicken leg on top in the middle, pour any juices on top. Arrange the cut beets around the leg, as well some crumbled feta cheese and the toasted pine nuts. 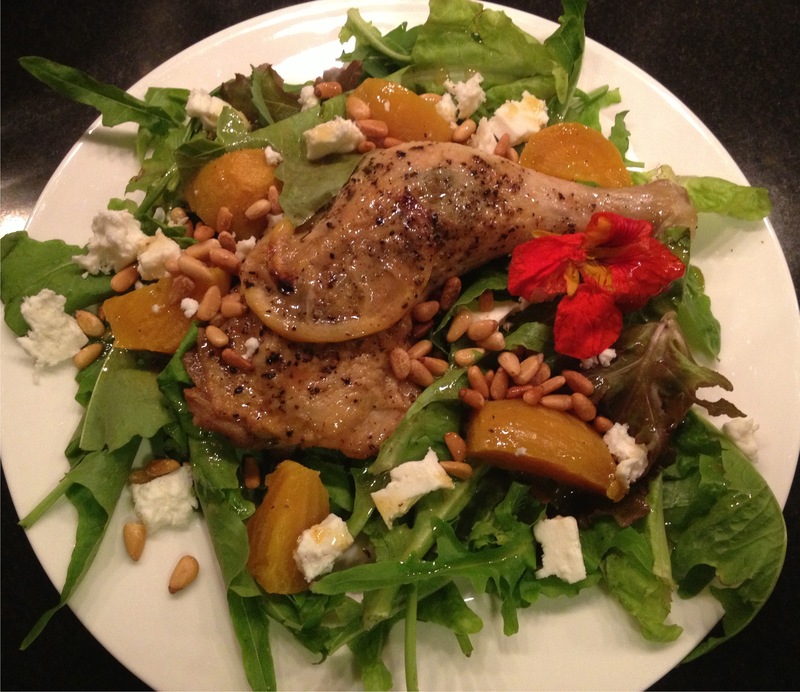 Drizzle on the sherry vinaigrette and serve right away. Enjoy!!! You will LOVE this!! With autumn officially here, even though I love the season, here’s a way to hang on to summer for just a little bit longer. I think it’s fun to plan a dinner around a specific theme. Not like the crazy tablescape lady on Food Network. I just learned that she is our Governor’s live-in partner! Yikes! She’s probably a nice woman but really, she’s a bit much. We had some new friends over for dinner last Saturday. Well not really new. Anne and I did business with one another some 20 years ago! She had a creative placement agency. In those days, my company did a lot of package design for a fragrance company called Tsumara. We often needed textile designers to design the background patterns on these packages. 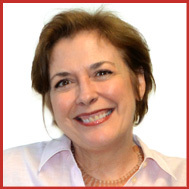 Anne supplied me great ones on a freelance basis. I ran into her recently at a New York Times /AMEX Business Summit. I gave her a LOVE card and she checked out the blog and recognized Ethel and Ethel’s garlic from an earlier post! We discovered our weekend houses are very close to one another. Isn’t that great? So for our dinner together, I wanted to take them to Greece. 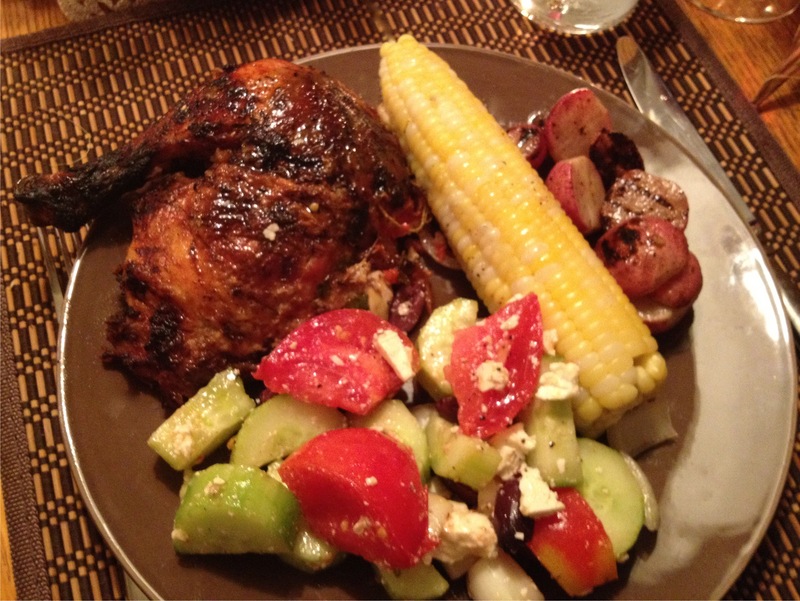 We made a grilled Greek chicken recipe that my husband and I used to make all the time after our visits to Santorini. You take a whole chicken and stuff under the skin: slices of tomatoes, covered with dried oregano, sliced onions and thin slices of feta cheese. Grill it with a lemon-based sauce and voila, you’re in Greece. 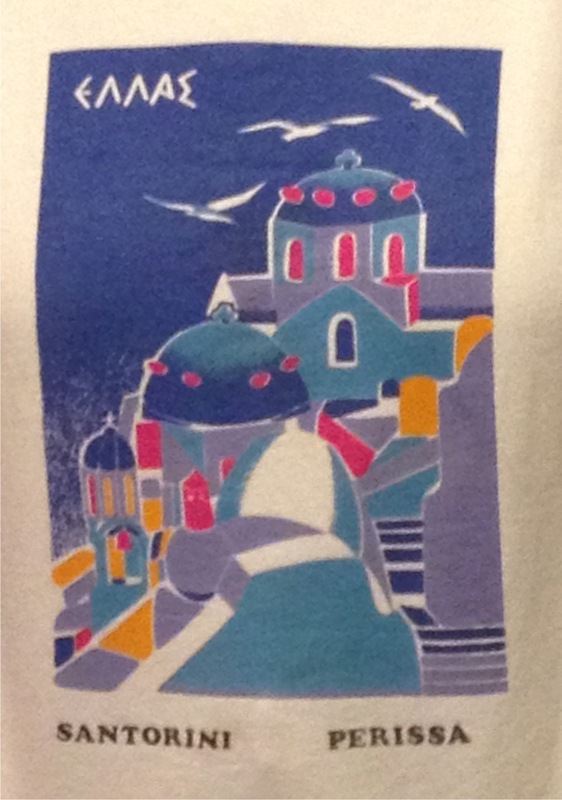 They do this all over Santorini on the street outside of small restaurants and everything is so fresh and good. 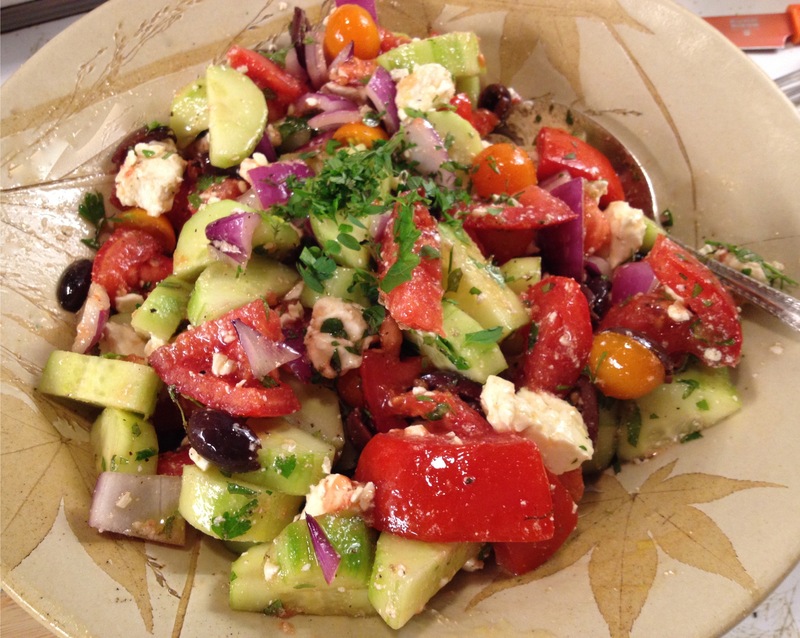 Serve it with a simple Greek tomato and cucumber salad and you are set. Try it – it’s delicious!! And grab a little bit of summer one last time. Wash and thoroughly dry the chicken. Trim off any excess fat. Refresh it with a half of a lemon, squeezing the juice out all over, inside and out. Pat the chicken dry again. Cut the tomato in 4 or 5 slices. Sprinkle each slice liberally with dried Greek oregano. Carefully, use your fingers to separate the skin from the meat on both sides of the breastbone and on both sides of the backbone. Into each quarter slide one tomato slice, oregano side down, one onion slice and one good slice of feta. If you need to cut a tomato slice or onion slice in half, to fit it all in, do so. If you accidentally tear the skin, use a small skewer to sew up the tear. Salt and pepper the chicken all over to your liking. Grill the chicken at about 350 degrees, basting with the sauce 3-4 times throughout the cooking time. It should take about 45 minutes. You could also do this in your oven. Preheat the oven to 550 degrees. Place the chicken in for 10 minutes, then lower the heat to 350 and roast for 45 – 50 minutes, basting three times with the lemon garlic sauce during this time, every 15 minutes. Check to see if it’s done with an instant read thermometer. It should register at 155 degrees. In a small saucepan, melt the butter in olive oil over low heat. Add garlic and onion, cover and sweat for 15 – 20 minutes. Check often, stir and do not let it brown, but you want it to be meltingly soft. Add the rest of the ingredients, except for the water, stirring well. Raise heat to medium-high and whisk in water. Stir until mixture boils and then remove from heat. This can be made a couple of hours before you’re going to use it. Keep it at room temperature. 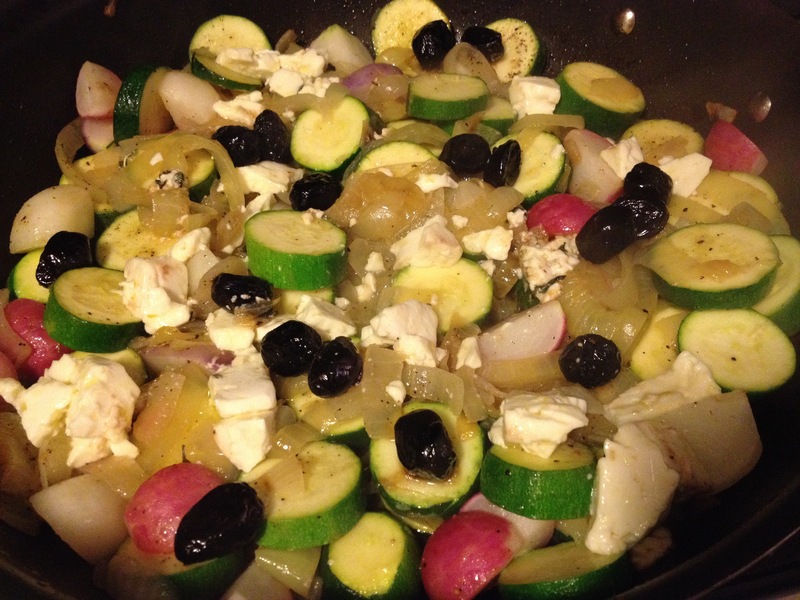 Place tomatoes, red onion, cucumbers, olives and feta cheese in a large bowl. Drizzle with the best olive oil you have and a few splashes of red wine vinegar. Sprinkle with a little salt (the feta will be salty so not too much), fresh pepper and 2/3 of your chopped oregano leaves. Toss lightly to combine. Garnish the top with more oregano leaves.